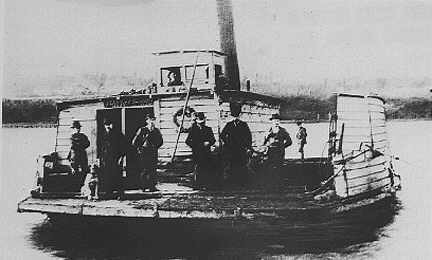 The Ferry K de K operating between Surrey and New Westminster in 1884. The ferry licence was sub–let to Angus Grant of New Westminster who built the ferry and named it after a close friend with the unusual name of Knyvett de Knyvett. A selection of ferry rates appear below. Passengers over ten years, twenty cents, thirty–five return. Wagons, from fifty cents empty to one dollar with two horses and a load. Buggies, sleighs and cutters from twenty–five to seventy-five cents. Sheep, pigs, and other animals under one year, ten cents. Oxen, cows, heifers, horses or mules twenty–five cents each. Reaper or mower with one span horses, two dollars. Threshing machine, two dollars and fifty cents. General freight, fifty cents per ton. The roads of Surrey, like those of the Fraser Valley in general, focused on New Westminster, at the time the largest city on the mainland. The Fraser River at New Westminster has been crossed for years, first by canoe, later by row boat - a single trip one way cost one dollar. This was a great hindrance to normal movement. During 1883 a number of joint meetings of Surrey and New Westminster authorities were held in an attempt to establish a transportation link across the Fraser River. A steam ferry, called the K de K, sublet from the joint municipal authority to Captain Angus Grant, went into operation that fall. It was to give hourly service from 6 a.m. to 8 p.m. every day but Sunday, when shorter hours were established. With the initiation of a regular ferry service, it became the immediate ambition of every farmer, to own a wagon and team so that he might have his own transportation to the city. 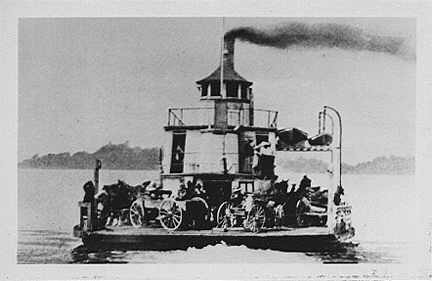 In 1889 the K de K was replaced by the steam ferry Surrey, which was operated by the City of New Westminster until the opening of the New Westminster Bridge in 1904. In 1889, the K de K was replaced by the steam ferry Surrey. This picture shows the steam ferry Surrey mid-stream in the Fraser River between New Westminster and Brownsville. The Surrey operated from 1889 until 1904 and the opening of the New Westminster Bridge.